It was no doubt authoritarian and draconian and there may well be many unforeseen emotional and psychological side-effects to come for many generations, but the bottom line is that the Chinese one-child policy has done the trick insofar as population numbers is concerned. 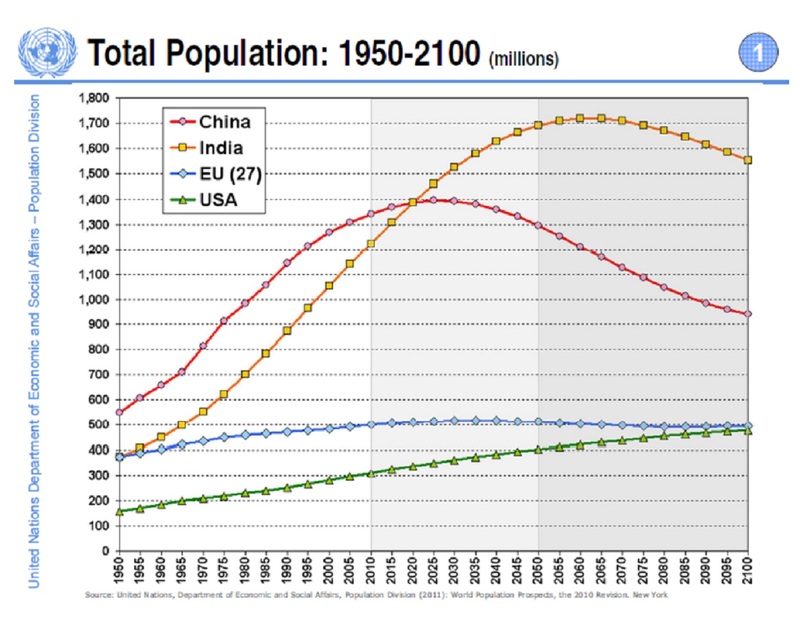 The Chinese population will reach its peak of just under 1.4 billion around 2020 and will then decline dropping to less than 1 billion by 2100. Around 2020, India’s population will exceed the Chinese population and will continue to increase until about 2060 reaching a peak of about 1.7 billion. Then by 2100 the India population will have declined to about 1.5 billion. Reuters: China unwrapped its boldest set of economic and social reforms in nearly three decades on Friday, relaxing its one-child policy and further freeing up markets in order to put the world’s second-largest economy on a more stable footing. The sweeping changes helped dispel doubts about the leadership’s zest for the reforms needed to give the economy fresh momentum as three decades of breakneck expansion shows signs of faltering. The chart below is based on an analysis of the World Population Prospects 2010 and not on the latest 2012 projections. However the numbers and trends are largely the same. Even if fertility rates now increase much more than predicted, the Chinese government now has a tried and tested – if disliked – population control method to fall back on. An increased fertility rate is now absolutely necessary to avoid a major aging challenge after about 2050 when the ratio of the working population to the supported population could reach crisis levels.